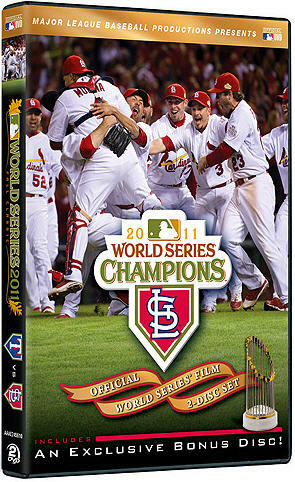 2011 WORLD SERIES HIGHLIGHT FILM 2-DISC SET – CLICK HERE TO BUY! In the OFFICIAL 2011 WORLD SERIES FILM, the annual, crowning program from Major League Baseball Productions, St. Louis native and narrator Jon Hamm (Mad Men) delivers the redoubtable Redbirds championship run, from first pitch to last in a pulse-pounding documentary format. Providing comprehensive highlights, exclusive access and interviews, plus breath-taking footage and sounds captured by MLB cameras and microphones throughout the series, this DVD is a perfect way to relive the epic battle against the Texas Rangers. The OFFICIAL 2011 WORLD SERIES FILM will be released as a 2-disc set, featuring an exclusive bonus disc containing the complete NLDS Game 5 vs. the Phillies, a taut 1-0 pitcher’s duel which propelled the Cardinals to the NLCS and, ultimately, the World Series. Additional extras include behind-the-scenes interviews and bonus programming. Just in time for the holidays, the OFFICIAL 2011 WORLD SERIES FILM 2-Disc DVD will be available on November 22 and will also be available in the crystal clarity of a single Blu-ray disc on December 6, both currently available for pre-order on worldseries.com. CLICK HERE TO WATCH A TRAILER FOR THE FILM!